With a couple of day off work, I've been catching up on some stitching projects. My new camera arrived in the middle of it, so a great opportunity to play with it and capture a bit of my "studio" space! I tried stitching in my daughter's old room. I really did. But that grey just got me down and it felt closed in and away from everything, even though it is just steps down the hallway from the breakfast nook. So I'm back stitching in the breakfast nook. For some reason, this room, whose window is the same size and faces the same direction as my daughter's old room, seems to bring in so much more light. I find I like the view slightly better too as it looks out over the patio and garden space. It's also more open feeling with a large open doorway to the kitchen and another to the dining room. I'm just so much happier stitching in this space. 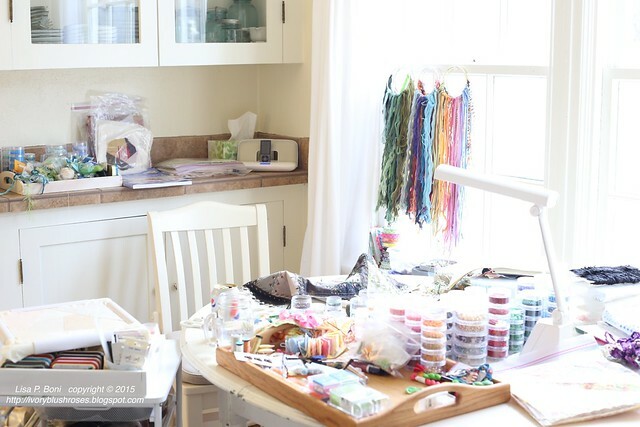 I'll probably move the rest of my sewing stuff up to the other room, but this is where I'll spend my hand stitching time. Some of the pearl cottons and ribbons have been put on 4" rings, which I've hung for the moment on the window. Love all the color! All the seams are now finished on the Feather Stitch piece! 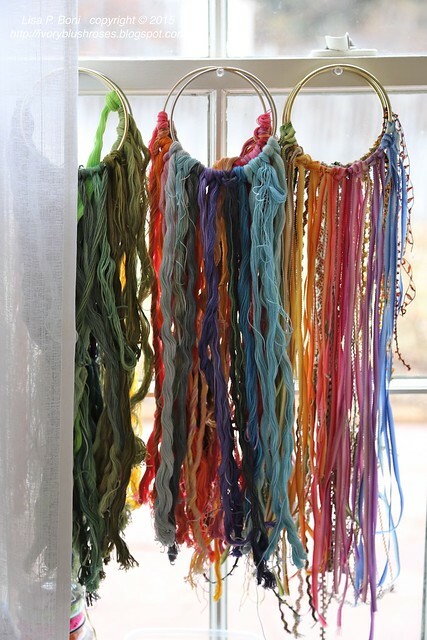 37 different feather stitched seams and one cabled chain, which I had done before I started feather stitching. I really love how it has turned out so far and am excited about the way I want to finish it... but more about that later! Here is a look at the rest of the seams. 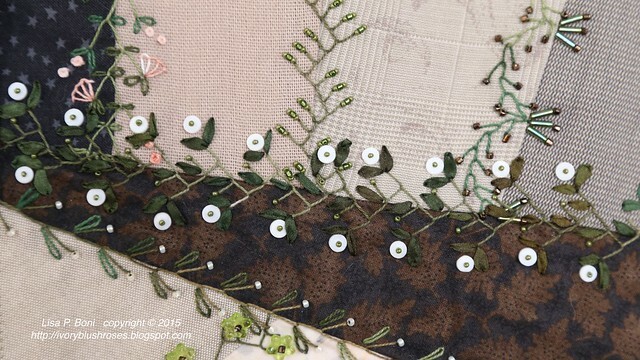 This one has oyster stitch flowers. A feather stitched vine sprouts out of the cabled chain. 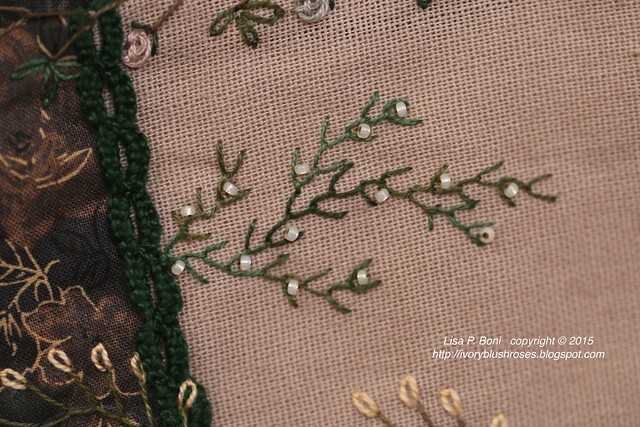 A combination fo feather, fly stitch and french knots. Yet another variation on a triple (double) feather stitch with lazy daisies and a fly stitch. 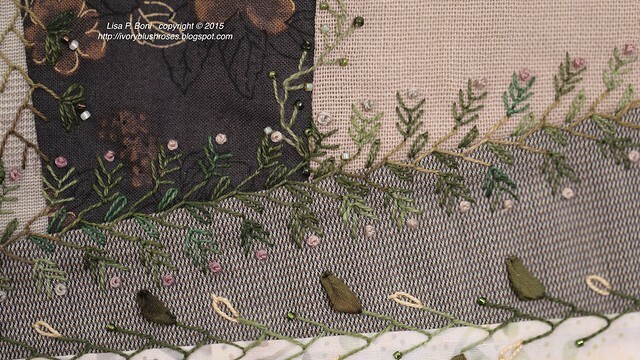 Feather stitching with silk ribbon embroidered leaves and french knots. 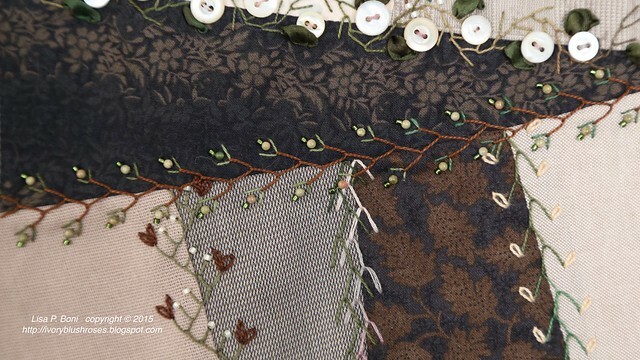 I love the leafy look of this straight feather stitch with lazy daisies! This one has a very wild grassy look to me. Loose and open. 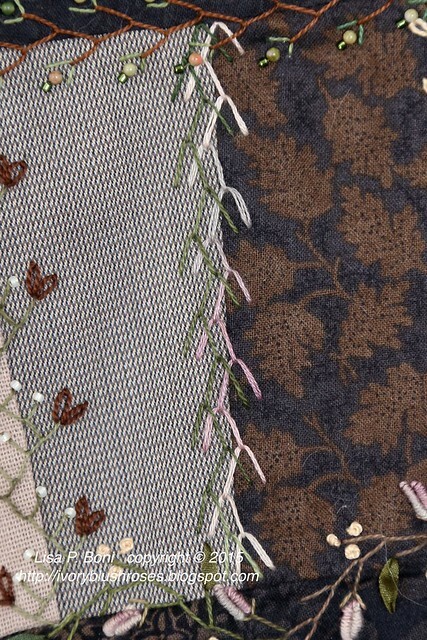 A laddered feather stitch with straight stitch and lazy daisies. This is a doubled feather stitch. 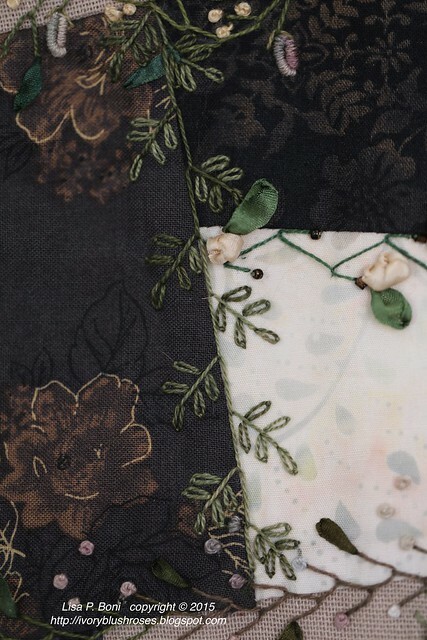 I've found that the two tone fabric on the left side of it makes it hard to see the stitches! Really happy with how this came out though. 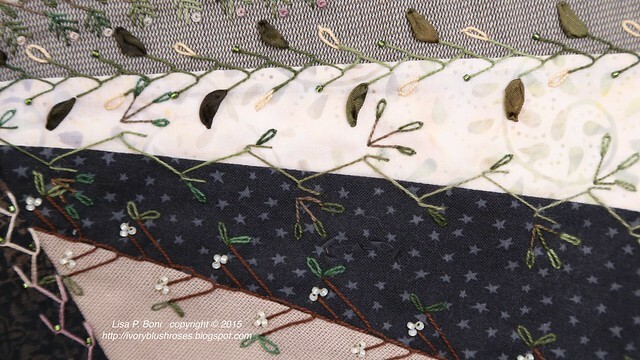 A variation of feather stitching with a cupped stitch that I use quite a lot. 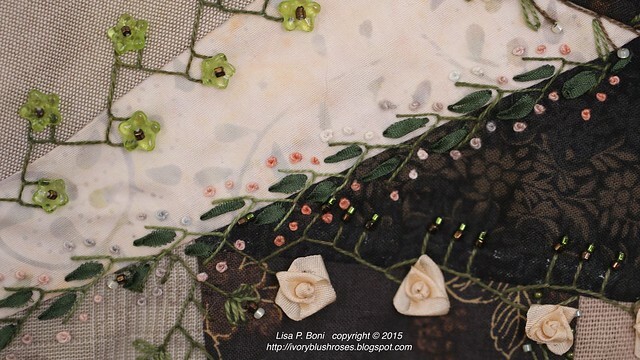 This time I used some tiny jade beads in shades of green and peach. 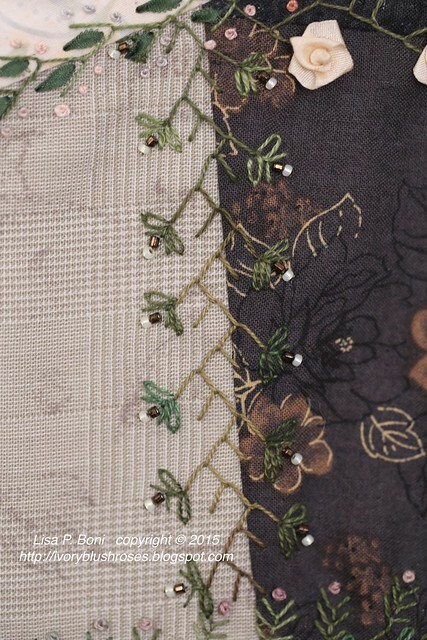 I wanted to add one more seam with mother of pearl buttons, but I didn't have enough teeny tiny buttons. Some heshi shell from an old broken necklace filled the bill nicely! Here's a look at how I hope to finish this piece. 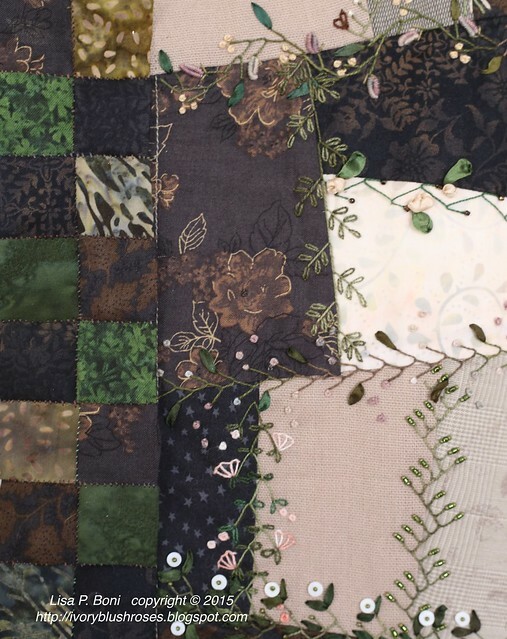 There will likely be a narrow band of dark brown in between the crazy quilted piece and the square inch stitched border. I haven't decided yet if I will do more stitching on the little squares or not. As I said earlier, my new camera arrived! The old one has taken more than 60,000 photos and has been giving me some fits occasionally. Now it can rest and I will use it for back up. The new one, a step up to a "premium" level camera, is amazing! 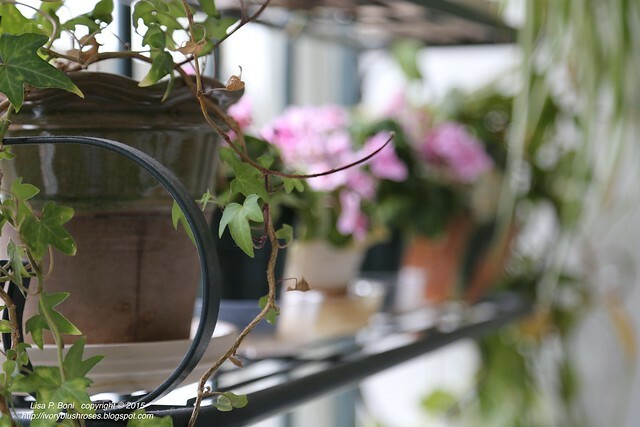 I had to play with it around the house and so took some photos of my plant shelf in the laundry area. 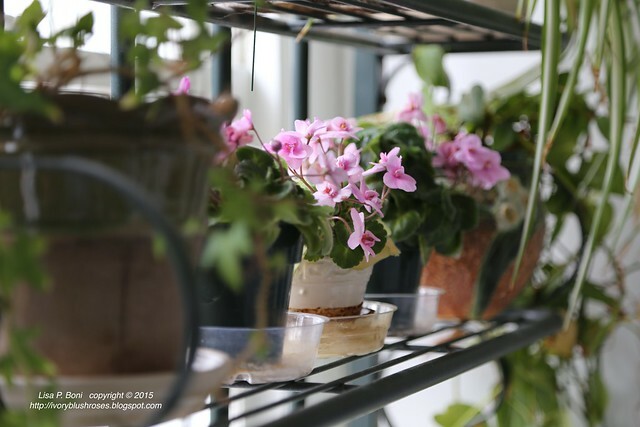 The little miniature african violets have bloomed almost non-stop since late last summer! This camera makes it easy and quick to change the focal point! Same shelf, almost exactly the same view, but focusing on the ivy now. This new camera definitely reads the light differently than the old one. Learning to take the best photos I can with it will be another work in progress! Of course I had to take the camera outside too. 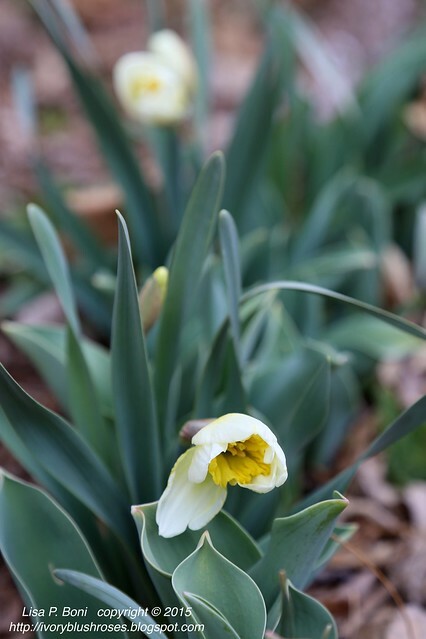 To my delight, I discovered that with the melting snow, the daffodils in my protected corner along the front walk are beginning to bloom! Hurrah! Spring is upon us! 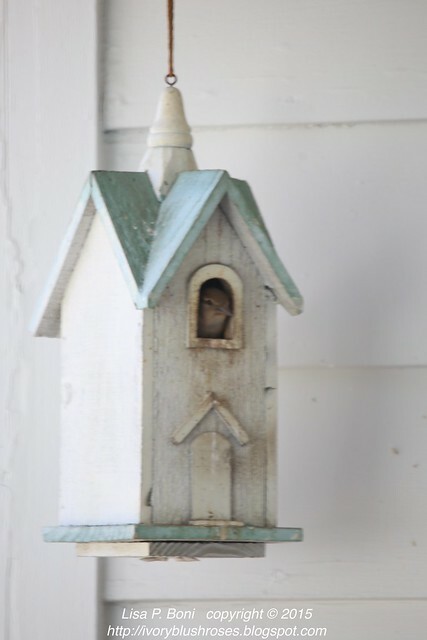 The birds think so too as the sparrows are already nesting in the little birdhouse on the side porch! The robins have been singing glorious songs in the warmish evenings and all the little songbirds have been filling the air with their twitter-pated song! I love that Spring is working its way along too! Just another lovely work in progress! Can't wait to see the finished result! Your stitching is just wonderful! So neat and precise. You give me a "bar" to aspire to. 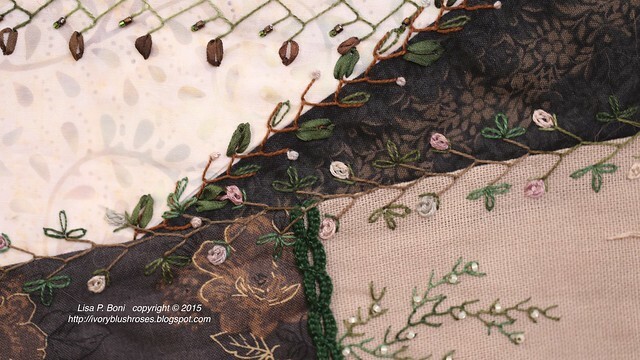 As always more beautiful stitchery from you. The colors in this piece are lovely too. I'm visiting from the BCQC blog. Nice to meet you. 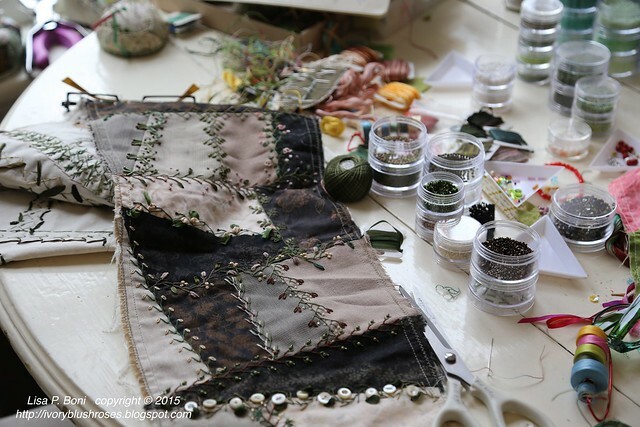 What a lovely blog and your sewing pace is delightful!